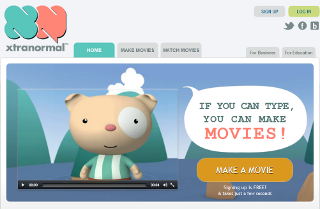 Xtranormal is a site that allows users to create short animation videos based on a text script. The text can be annotated with additional information, such as a background scene, custom appearance details for the involved characters or emoticons which reflect character gestures. Xtranormal allows users to create 3D scenes via a drag and drop interface. There are hundreds of actor models to choose from, as well as different backgrounds, lightning configurations and camera setups. The company offers both downloadable software products as well as a web-based video creation service. Until 2011 it claims to have created over 10 million videos, and the counter keeps going. The site managed to attract a strong audience with hundreds of thousands of visitors in each of the last 12 months. Xtranormal was funded in 2006 having Richard Szalwinski as one of the initial co-founders and CEO. He left the company in 2010 and Graham Sharp took over as the new CEO. The company currently has 30 employees according to CrunchBase.